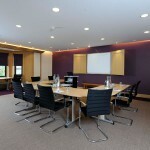 Hire a Boardroom or Meeting Room in Canterbury, Kent. The light and airy Common Room enjoys breathtaking views of Canterbury Cathedral and is the perfect choice for small scale meetings or events of up to 50 delegates. The Common Room also provides an ideal option for less formal gatherings, drinks receptions or as a communal area for exclusive use. 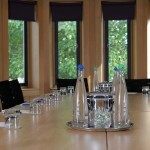 The Campanile Garden, located next to the Common Room is ideal for delegate conference breaks. I can confirm that we had a truly wonderful evening on Friday! All of the staff were accommodating and resolved any issues that arose professionally and quickly. We appreciated all of your assistance in preparation for the event. All of the feedback that we have had has been extremely positive and it has been described as the, 'best law dinner in years'. The food was delicious and service was excellent. We look forward to working with you again next year!